How to calculate the lightning distance? Our lightning distance calculator will help you to estimate the storm distance . Imagine a cloudy, sultry, summer afternoon. You see that the storm is approaching - sudden dazzling lightning strike, couple moments later a deafening thunderclap. Are you in a safe place, how far away is the lightning? The distance may be easily calculated from the time difference between noticing the lightning and thunder. If you are still unsure how to calculate lightning distance, keep reading and give the calculator a try! where time is a number of seconds between noticing the flash and the thunder; speed_of_sound is a speed of sound in the air, at the chosen temperature. If you know how warm was during that stormy day, you can check the speed value in our speed of sound calculator, and apply that exact number. Did you notice that it's nothing else than a transformed simple formula for speed? The method of counting the seconds between lightning and thunder is sometimes called flash-to-bang technique. So how far is the lightning? Watch the stormy sky. Hopefully, you are at some distance from the thunderstorm, not in the middle! As soon as you notice the lightning strike, count the number of seconds until you hear the thunder. Use your watch, phone or try to count seconds as accurately as possible. Assume that in our case it's 15 seconds. Calculate the storm distance. If you want to know approximately how far away is lightning in miles, divide the number of seconds by 5, for kilometers divide the seconds by 3. It will give us 3 miles or 5 kilometers. 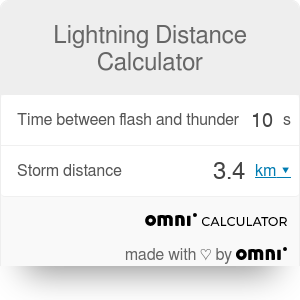 Or simply use our lightning distance calculator, which can calculate it more accurately at a speed of light! Lightning Distance Calculator can be embedded on your website to enrich the content you wrote and make it easier for your visitors to understand your message.